These premium binoculars of the BRESSER Pirsch series are the ideal model for use at dawn and dusk thanks to their high light gathering capability. The BRESSER Pirsch 8x56 binoculars are armed with the newest phase coatings and let the picture shine more clear in contrast and high-definition, reinforced by fully multi-coated lenses. Due to the use of BaK-4 glass material you obtain a bright and clear picture. With twist-up eyecups, spectacle wearers can also enjoy the full field of view. They are adjustable in 2 steps and also support the view without glasses. 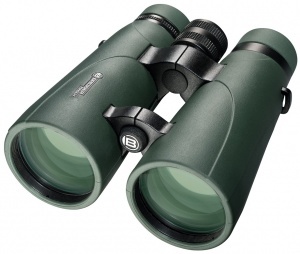 The BRESSER Pirsch Binoculars have a rubber armoured body for solid grip. All Pirsch models are armed with a broad and very comfortable neck strap. To make the package complete these binoculars are waterproof and nitrogen purged to prevent against fogging. Supplied with nylon case featuring shoulder strap and belt loop, broad padded carrying strap, protective objective lens caps, protective eyepiece caps, lens cloth and manual.